Playing with texture can add a whole new dimension of effects to your cardmaking. This Christmas card combines the three-dimensional texture of Bazzil with the sponged effect created with small ink pads to create a unique look for your holiday greetings. 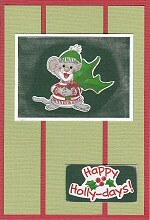 To create this card you will need Lava Red Bazzil cardstock or ready made card, Light Green Bazzil cardstock, dark green cardstock, white cardstock, silver ink and Suzy's Zoo Mouse with Holly Stickers. Begin by making your card. I used a ready-made Bazzil card, but you can also cut your own from Lava Bazzil cardstock. Next, cut three strips of light green Bazzil. They should all be of equal height and a little shorter than the height of your card. Two of them should be approximately 2.5 cm wide and the other about 4cm wide. Adhere them vertically to your card. Cut a rectangle of dark green cardstock and stick your mouse sticker in the middle. Using your silver ink pad, lightly sponge the edges of the cardstock around your mouse. When dry, mat on white cardstock and adhere to your card. Cut another rectangle of dark green cardstock. This time, make it much smaller - just big enough for your 'Happy Holly-days' sticker. Adhere your sticker. Again, we are going to use the silver ink to enhance this element. Instead of creating a sponged effect as before, keep the ink only on the edges. The ink will be more concentrated and you will end up with a silver border. Once dry, adhere to your card. You now have a gorgeous card to give your loved ones this Christmas!